Originally this blog post was going to be about my experiences of getting a pump and the huge difference this has made to my life with diabetes - and maybe at some point I will post about that, but not today. Why? Because, whenever I sat down to think about what I would write, there has always been another thought in my head that seemed more important to share and when I thought about it more and more... I realised it was the most important thing. Over the past couple of years I've been struggling with my diagnosis. For some of that time I've not even realised this myself. Indeed, withdrawing from the running of Our Diabetes (something I do feel bad about) was in part to give me space to resolve the challenges I've been dealing with. In the days Before Pump (BP) my diabetes regimen was ridiculous. I was seeing the DSN at the hospital every month (sometimes more!) in an attempt to gain insight into how to manage my glucose levels. Yet no matter what tweaks to the ratios were made; no matter what new "rules" were test driven; no matter what basal rate changes where made; or indeed what different insulins were explored, nothing would get me to where I needed to be. You get the idea. Breakfast and dealing with exercise wasn't much better either! Only lunch was easy to deal with - 1 unit per 10g of carbs. FULL STOP. All this effort would be made just to get me to a good bg number I could go to sleep on and in the main it did. However, pretty much without fail, I would wake in the 20s (even if I woke in the night to do a correction dose) and I'd spend most of the day chasing my numbers down to something more reasonable. My bg diary notebooks would resemble the workings out for an A level maths test and sometimes I'd make mistakes - because running so high all day, day after day was extremely tiring. The arrival of the pump changing things immediately. After Pump (AP) it was like being on a diabetes holiday. All my ratios returned to 1 unit per 10g of carbs and all of a sudden my numbers would spend most of the time under 10mmol/L without any effort required - not where I want to be but a significant improvement on where they had been. The notebooks were ditched and every meal was a simple carbohydrate count. The "holiday" is now over and I'm looking to get my hba1c back to where it used to be and what's great is I'm enjoying the challenge. When my basal requirements change it's not a feeling of disappointment and despair, it's a feeling of "let's do this!" You lied! The pump is the thing you value most! No doubt about it, the pump has changed my life - my numbers are more in target, my ability to exercise has been reclaimed, but it's not the thing I value most. It's not because I don't value it... far from it! It has been one of the best interventions in my diabetes management to date. But the fact it's not top of the list really puts into perspective just how much I value this other thing. The thing that knocks the pump from the top pedestal. What's really got me through my diabetes journey isn't technology, it's the people around me! My wife. She's "put up" with me being miserable, grumpy, tired, irritable, no doubt impossible to live with at times and throughout all this she has been there for me. My friends on social media and work, some of whom I've shared some of my challenges with. The ones who have just listened, have understood, have offered support and ideas and never judged. You know who you are - thank you. ...and.... as equally important, my healthcare team. A team I know would move heaven and earth for me if required so they could get me the care and results I need. Over this period of time they have been patient, they've listened, they've offered advice, they've never given up, they've invested in me and believed in me and all of that has paid off. The care and compassion shown is truly outstanding. I consider them my extended family and I'm truly blessed to have them by my side. I leave clinic with a smile on my face knowing just how much they want me to succeed. It might be raining outside whilst I write this blog but inside I'm full of sunshine. So this post is dedicated to you - my friends, my family, my extended (healthcare) family - it's you I value the most! I want your thoughts, Jamie wants your thoughts, Parliament wants your thoughts! The Parliamentary Petitions Committee have invited me to a panel discussion with Jamie Oliver, Helen Jones MP (chair of the petitions committee) and Dr Sarah Wollaston MP (chair of the health committee) at the House of Commons on Monday. Once again I have to thank the Parliamentary Outreach team for helping to arrange this! It's taking place just before the House of Commons debate discussing the Jamie Oliver petition which called for a tax on sugary drinks to improve children’s health. It will also coincide with the publication of a report from the Health Committee on childhood obesity. I'm sure you'll have heard all about the sugar tax petition, but you can read all about it on parliament's website if you wish. You will also be able to use a link on that page to watch the Westminster Hall debate live on Monday from 4:30pm. I will also be tweeting about what happens on the day (subject to my multi-tasking abilities!) so please join in with the discussion. The panel discussion will focus on both the petition and the link between sugar and childhood obesity, as well as the forthcoming debate. It's an opportunity for me to share my thoughts, ask questions and (hopefully) shape some of the parliamentary debate that will follow. So, if you have any thoughts on the petition (or the report) that you'd like me to share then please let me know either by commenting here, tweeting me @davidcragg or sending me a DM or email.... before the Monday debate obviously! Is it time the food industry was brought into line? No, I'm not talking about the sugar tax that has had a significant amount of news and hype around it recently. Nor am I talking about salt content, or any of the other myriad of conversations around nutritional levels in food. I'm talking about the industries use of the word "diabetic" and phrase "suitable for diabetics" to promote their products. The industry is essentially exploiting the health of those with diabetes and their friends and family who think they are helping when they buy these products at extortionate prices. Back in 2002 Diabetes UK teamed up with the Food Standards Agency to issue a joint statement on "diabetic" food, this was reinforced in 2007 with a further statement. With it came some initial success. 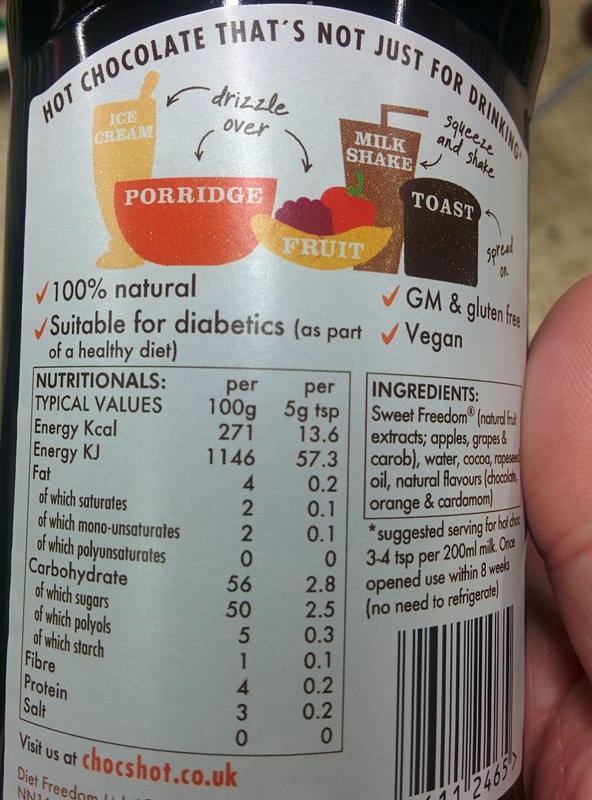 Boots UK who had been selling a "diabetic" food range changed the labelling removing the word diabetic. Unfortunately it wasn't long before Boots decided it preferred profits over the health education of our country. "Boots UK takes the opinion of customers very seriously. In 2002, on the advice of Diabetes UK we removed our Diabetic Food Range. 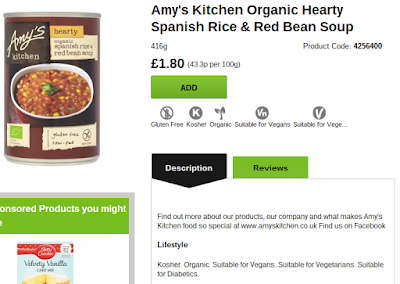 However, we received significant, sustained customer complaints about the lack of a specifically labelled Diabetic Food range at Boots UK and we always listen to their feedback carefully." "Our customers told us that they liked the peace of mind of being able to buy 'treat' foods clearly labelled as suitable for those living with diabetes. In light of this customer reaction, we took the decision to reinstate the Diabetic Food Range in 2005. The range is designed to offer occasional 'treat' food that those with diabetes often miss, such as no added sugar chocolate. These occasional foods are not designed to be a main part of a balanced diet. Boots UK recommends that people with diabetes follow a healthy, balanced diet with a wide variety of foods, and we offer advice and information in store and online and our pharmacists are available to help and offer lifestyle advice. We listen to our customers and care about their opinion – we are aware of the issues surrounding this type of range and carry out regular reviews." But it's not just Boots UK that are cashing in on what I'm crudely going to call the "diabetic pound". 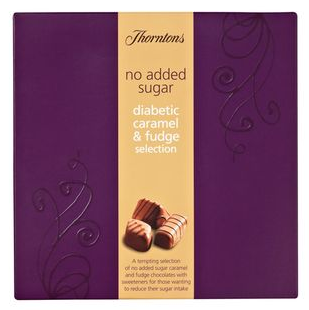 Thorntons Chocolate have what they are now calling the No Added Sugar Chocolate range, but look at the packaging and it is clearly labelled as diabetic. Debenhams Flowers sell a Thorntons Diabetic Selection Pack which turns out to be 596 grams of chocolate for the bargain price of £28.99 and given the laxative effect of polyols, a day on the loo is most probably included for free too! Even Hotel Chocolat, who when challenged claim to agree with and support the Diabetes UK positional statement on diabetic food, blatantly ignore the fact they are marketing food "suitable for diabetics". In this instance they aren't using polyols but instead a high cocoa content as their reasoning. At least that means you don't have the joys of the polyol laxative effect, but never-the-less they are very much joining in with the rest of the industry in cashing in on the "diabetic pound". There are many more examples of "diabetic" food products from jam to cookies to fruit sweets to cakes and even ice cream! Yes diabetic ice cream! Franks Ice Cream has a range of "diabetic" ice cream which I'll come back to shortly. 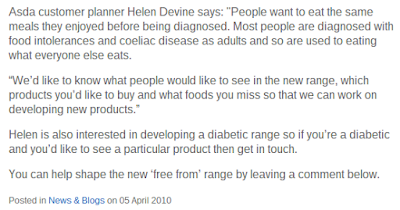 "Don't buy diabetic food, it's expensive, will put you on the toilet and has no advantage over the products they aim to replace". 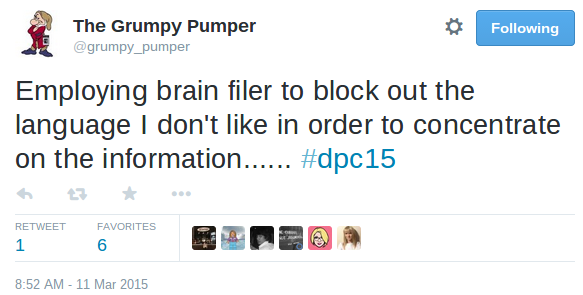 Excellent advice and it's something that I hear is shared by most HCPs around the country. It didn't stop my friends and family trying to be helpful and buy me diabetic chocolate - regularly! - but at least patients are getting good advice and they can hopefully educate those around them against the huge marketing machine of the food industry. "Don’t be tempted to buy diabetic foods. They are expensive, can still affect your blood sugar levels and often have a laxative effect. They also contain just as much fat and as many calories as non diabetic foods. Occasional small portions of the ordinary product would be a better choice." Some examples of this can be found at University Hospitals Coventry & Warwickshire (bottom of page 2), Tameside, Glossop and Stockport (top of page 5) and Derby Hospitals (page 6). 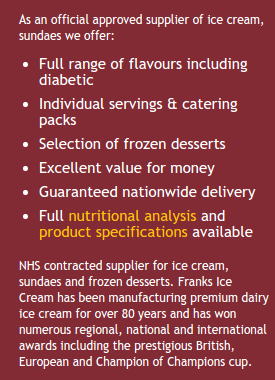 Yet, if you are an inpatient at hospital then potentially, if you select ice cream from the menu, you might be eating Franks Diabetic Ice Cream! In fact when you go on to Franks Ice Cream website they are almost using the NHS as an endorsement for their product! This shouldn't be allowed. I suspect (and this is a complete guess!) the reason might be that many inpatient catering contracts are actually run by companies on behalf of the NHS and those contracts only specify certain nutritional requirements but, whatever the reason, patients in NHS hospitals should not be given "diabetic" foods. Let's compare Franks "diabetic" ice cream to a really indulgent vanilla ice cream. Let's see just how much of a difference the diabetic version has on the amount of carbohydrates consumed. A whopping 0.5g of extra carbohydrates per 100g of ice cream (100g is approximately 2.5 scoops of ice cream) if you go for one of the most indulgent vanilla ice creams available over Franks diabetic version. In real terms, the amount of insulin required to deal with both of these products is exactly the same. What about those Thornton chocolates? Well, if you buy them, don't eat more than two chocolate pieces a day because Thorntons themselves point out that three pieces is deemed an excessive amount of polyol consumption and will cause you problems! WARNING: Excessive consumption may cause laxative effects. We recommend eating no more than 20g of polyols per day, though children or particularly sensitive people may react to levels lower than this. So, Cadburys Diary Milk has slightly less carbohydrates than the Thorntons diabetic chocolate. The profile of the blood sugar spike will be different but here is the rub... if you eat those Thorntons chocolates and need to take insulin you don't really know how much of that 61.3g you need to inject for. Why? Because, to not put to finer point on it, you don't know how much of those polyols will just "go through" you. Where do the supermarkets stand? "Retailers are recommended to stop selling ‘diabetic’ foods." Unfortunately a quick look on their website shows this not to be the case. I could find no policy statement about diabetic foods and they sell a range of diabetic ice cream and jam products. ...but happily sell a range of products labelled diabetic from icecream to jam! 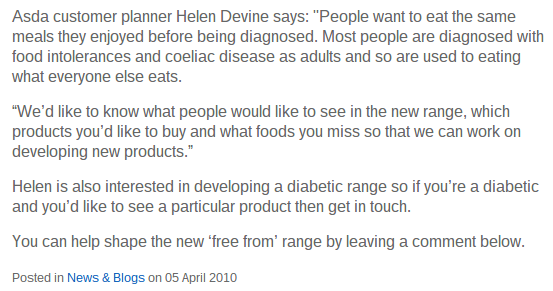 Not only did they want to create a diabetic range they were calling customers who had diabetes diabetics. A big no-no in my book. It looks like they didn't take that idea forward, but they do sell diabetic ice cream. 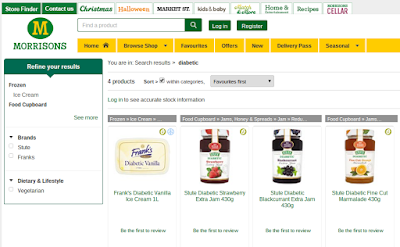 Waitrose has a page dedicated to diabetes, once again we see a supermarket calling its customers who have diabetes diabetics (and they also use the phrase diabetic control - another no-no!) and they clearly point out there is no need to buy diabetic products. ..but following the double standards of Morrisons you can happily buy diabetic jam and ice cream. Marks and Spencer also have a whole page on how to be healthy with diabetes, referring people to the Diabetes UK website and making it clear "suitable for diabetics" products should be avoided. It's difficult to be sure but I'm not aware of any products specifically labelled as diabetic in M&S - more research is needed! And finally, Sainsburys. Sainsburys has a policy referring people to the Diabetes UK positional statement but like many of the other supermarkets they are calling their customers with diabetes diabetics. 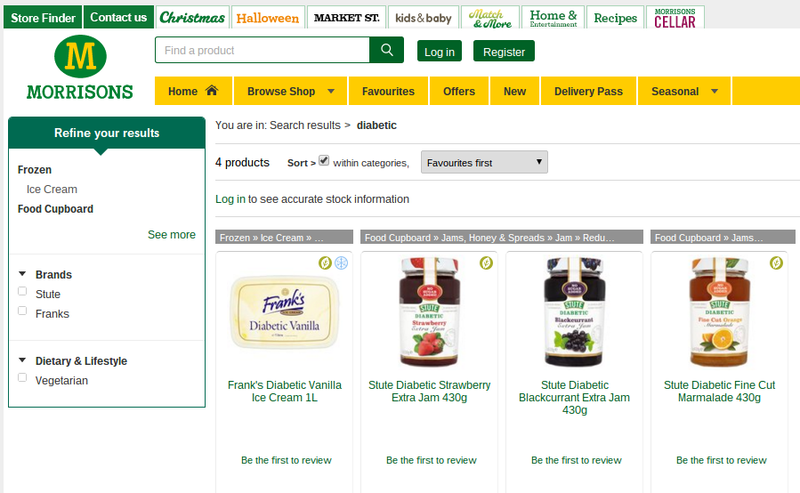 Unlike Morrisons and Waitrose however they seem true to their word and I can find no products labelled diabetic. Please let me know if you know of any products that they sell that doesn't align with their policy statement above. 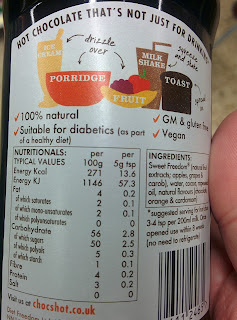 But even Sainsburys isn't impervious to the food industries marketing machine, with many products now having the claim "suitable for diabetics" somewhere on the product labelling. The most common place to find them is on chocolate and sugar products. One example is Choc Shots, which like all the food in the store is suitable for people with diabetes as part of a healthy diet. "suitable for diabetics (as part of a healthy diet)"
Sarcasm on full: Soup I can eat - it must be a first! I'd certainly like to see the supermarkets take more of a stand on this issue and put some pressure on the food manufactures to change their labelling and remove references to diabetics. Supermarkets definitely need to be part of the solution and not part of the problem. I have no problem with products being labelled as low in sugar or low GI, but that does not make them diabetic or suitable for diabetics! Surely the law regulates this kind of thing? Isn't the food industry one of the most highly regulated industries? How do they get away with it? Well I'm no lawyer and looking at all the regulations and directives all that is clear to me is that these documents are impenetrable and instantly cause my brain to switch off given the language used. (22) Conditions for claims such as ‘lactose-free’ or ‘gluten-free’, addressed to a group of consumers with specific disorders, should be dealt with in Council Directive 89/398/EEC of 3 May 1989 on the approximation of the laws of the Member States relating to foodstuffs intended for particular nutritional uses ( 9 ). In addition, that Directive provides the possibility that foodstuffs for normal consumption can indicate their suitability for use by these groups of consumers if they fulfil the conditions for such statement. Until the conditions for such statements are set at Community level, Member States may maintain or adopt relevant national measures. (7) Directive 2009/39/EC foresees that specific provisions could be adopted regarding the two following specific categories of food falling within the definition of foodstuffs for particular nutritional uses: 'food intended to meet the expenditure of intense muscular effort, especially for sportsmen' and 'food for persons suffering from carbohydrate metabolism disorders (diabetes)'. As regards special provisions for food for persons suffering from carbohydrate metabolism disorders (diabetes), a Commission report to the European Parliament and to the Council concludes that the scientific basis for setting specific compositional requirements is lacking. I'm totally baffled. Hopefully someone with a better understanding of the law can explain the rules in terms that mere mortals can understand but, the long and the short of it is, "diabetic products" are out there; products claiming to be "suitable for diabetics" are out there and; this marketing approach is increasing. In my eyes this is wrong but what can be done? Should we be lobbying the food industry? Challenging the NHS on the food they provide to inpatients? Lobbying the supermarkets to apply pressure for change? Lobbying our MPs to tackle this issue? Or as Diabetes UK positional statement says "Members of the public can make complaints about food labelling that they consider to be misleading to their local Trading Standards team"? Well, maybe we should be doing all of these things. How do you feel about your diabetes? That was pretty much the question I was asked by a medical design and development company. Well they asked me quite a few questions actually, they asked me to make a model representing my diabetes and to take some photos of what was important to me in managing my condition too. It was fun and interesting! It was interesting because despite learning everything I can about my condition, learnt the processes of managing it, I've never really explored about how I actually feel about diabetes itself - a part of my diabetes journey I'd never really explored. So I took up the offer to share some thoughts. I'm sharing my responses here and maybe it will get you thinking and sharing what diabetes means to you too. So what where the questions I answered? What does being T1D mean to you? It means I have a second full time job. One with no holidays or time off and one were I have to work harder whenever I'm sick. Although it is only a small part of me, it's something I can never forget about. What is your ritual for managing your condition (if you have one)? My fitbit alarm goes off every day at 11pm and I stop whatever I'm doing to inject my basal insulin. When hypo I refuse to treat until I have a bg test completed - much to the frustration of everyone around me (and indeed sometimes myself!) who can see I am clearly low and need to treat. Is there a worst thing about having T1D, and if so what is it? Dealing with the other health issues generated by it, the list continues to grow! The hard days such as waking with a high bg - getting out of bed and out to work requires a huge amount of mental effort to overcome the physical impacts while the insulin works its magic. Is there a best thing about having T1D, and if so what is it? The people I've met because of it (both in real life and virtually on twitter). The opportunities I would never had had without it: working with the parliamentary outreach team; speaking at parliament about diabetes education; creating (with the help of others) an online community of patients & HCPs around diabetes. Opportunities that hopefully contribute to making a difference in diabetes care. How in control do you feel of your diabetes and how do you try to keep in control? I wouldn't use the word control. I prefer the word manage. Lots of things sit outside of my control such as illness, stress, hormones - but I can try and manage my bg levels. (See my blog The dirty language used in diabetes for more details on the distinction). I manage as best I can with the tools I've been given. I am currently struggling to maintain a sensible range whilst awaiting a funding decision on an insulin pump that should allow me to manage better. I'm no artist (as you will see!) but I had great fun using the Sugru modelling glue provided to make my model. You might think he looks cute but diabetes is definitely not cute - far from it! What name or title would you give the character or object in your model? How does your model represent your relationship with T1D? Please explain why you have modelled your condition in this way and give details about any specific elements of your creation e.g. colours, shapes, additional props etc. and what they represent? The blue represents diabetes. It's a part of me, but not all of me and it can't be taken out of me. The dice represents the bg readings he gives me. Sometimes it can feel like luck (or bad luck) with no logic or reason for the number given (hence his name). The rule book - the pages are blank because sometimes he seems to like to change the rules, usually just as you feel like you've finally mastered them. He looks at you with needy eyes and the more you pander to him the more he behaves... you hope! What do each of your photos represent to you and your condition? Structured education has made a huge difference to me in managing my condition. The diaries (not all shown here obviously!) record every meal, bg test, insulin dose and time injected since starting on insulin and allows me, my DSN and consultant to reflect on what changes would help to improve my bg management. Without the needles, lancets, test strips, glucose tablets, ketostixs, etc I wouldn't be here - I guess that makes them important, so important an entire cupboard in the kitchen is dedicated to storing them. ...and the fridge! No eggs here! ...and of course insulin can be found in the fridge where the eggs should be. I guess the photos here show how diabetes takes over the kitchen and is a physical impact on not just my life but those who I live with too. Peer support. Hugely important to me... so much so I created a community with the help of another PWD! DAFNE can give you the knowledge, HCPs can give you the technical support, peer support gives you the emotional support, removes a sense of loneliness that can come with the condition and helps educate you on new and best practices. After my last post on the need to clean up the dirty language sometimes used by HCPs I was contacted by someone who asked if I'd allow an anonymous guest post and I was more than happy to do so. I hope, like me, you think it's worth sharing. Type 1 diabetes changed my relationship with food. I developed an eating disorder but I didn't tell anyone. When I lost weight everyone told me how great I looked and how well I was doing, so I carried on. It was about control and I was very good at it! Everybody wanted to know my secret so they could lose weight just like me. Eventually I couldn't carry on doing what I was doing. I'd controlled my eating so much that I could hardly eat. I tried to fix things on my own because I didn't want to admit what I'd done or what I was doing. At first I made progress and I was pleased with myself. I ate food and things didn't go wrong like I thought they would. When things happened that I didn't like I stopped until I got my confidence back and then I tried again. I wanted to have a normal relationship with food. But I wasn't addressing the cause of the problem, I was just trying to control it differently. I'd traded one eating disorder for another. Now I struggle with a binge eating disorder. I'm putting on weight and people now comment on that. Eating disorders have been my secret for a long time. I don't like what I do but it doesn't stop me doing it. I finally managed to tell my diabetes nurse (the one I see at hospital) what I was doing and I was referred to a psychologist. It seemed to take forever to see them even though it was only a couple of months. I'd unravelled my problem but had no help to put the genie back in the bottle whilst I waited. Eventually I had my first meeting. Nothing really changed. Same with the next and the next and then something changed. Talking and thinking about what I was doing started to help me and the binge eating started to become less regular. The gaps between binge sessions stated to become bigger. I still had them, I still found it hard, but I was starting to deal with them better. I knew I wasn't better but I felt I'd finally started to make progress. When I had my diabetic annual review with the practice nurse I realised I wasn't as far on as I thought I was. She checked by blood pressure, told me my hba1c (7.6%) and then asked me if I wanted to be weighed. I told her I'd just seen my diabetes nurse at hospital and had been weighed there. She seemed put out that I was seeing someone else about my diabetes but I carried on and told her my weight anyway. Then she commented that my weight had increased significantly since the last time I'd seen her. ARGGH! Tell me something I don't know! I have to see myself in the mirror every day! I thought they knew I had an eating disorder and so I mentioned that I was seeing a psychologist for my binge eating and then it got worse. She decided to lecture me, er, give me some advice. "Well you know the difference between those who are over weight and those that are not? It's that they stop eating when they've had enough. They don't eat when they aren't hungry or bored." WHAT???!!! That's not it? You really don't understand, you don't understand what I'm going through and you REALLY, REALLY aren't helping with your advice!!! If you asked me about what is going on rather than assuming then maybe I wouldn't be shutting down whilst sat in this room with you! Thankfully she had no further advice to give and didn't want to check anything else. I was going to ask why she hasn't checked my feet; what my urine results were, ask about all those other things you are supposed to check. Instead I just wanted to leave and that's what I did. Kicking myself. I went home and binged. I hadn't done it for three weeks but this pushed me back to the bad place I've lived in for so long. In the evening I did it again. I've never binged twice in one day before. I feel like I've gone back to square one, no, to square zero. The following day I woke with a bg over 22. The first thought that drifted through my head was that it would minimise the weight gain. So thank you to the practice nurse who gave their advice. It helped me realise I've made no progress at all. I'm not sure if I'm more annoyed with what the nurse said or how I dealt with it afterwards. I think I hate myself more for what I did. It's been interesting watching the discussions about language coming from those attending the Diabetes Professional Conference this week. The use of the word "non-compliant" being a particular annoyance for both patients and HCPs alike. You can look back over the tweets from the conference by looking at the hash tag #dpc15 - there are lots of interesting tweets sharing information from the various sessions - well worth a read! What really surprised me was how quickly the "non-compliant" word was used. Twitter was already talking about it at 8:52am on day one of the conference and exhibition only opened at 7:45! Why is "non-compliant" such a dirty word? "Failing to act in accordance with a wish or command"
Ok, that's a loaded word! In this debate about appropriate usage of words I have already used another contested word in this post. Have you spotted it? What? Why? I hear you cry. Well in many ways it's linked with the non-compliance definition. Many see it as reinforcing the old view of the HCP-Patient relationship were a HCP gives "commands" and the patient duly "complies" - or "should" comply, otherwise they will be deemed "non-compliant" and poor outcomes will lie firmly at the patients feet. Suggested replacements for the word patient include citizen or person. I remain to be convinced by these suggestions but I can understand why people are grappling with words. Language and words evolve, times change, words take on new meanings and new words get picked up and spread so far they become part of the ever changing lexicon of the English language. As Laurie Anderson said: Language is a virus! So the patient-HCP relationship should be one of equals rather than the paternalistic relationship of the past and "non-compliant" isn't a helpful phrase because it essentially puts the blame on the patient for less than ideal outcomes, without understanding the underlying cause for a patient not following the "commands" of the HCP. Thankfully there are plenty who are thoughtful in their language and want to stop others from using unhelpful words and phrases, including Partha Kar who spoke about it in a conference session later in the week. 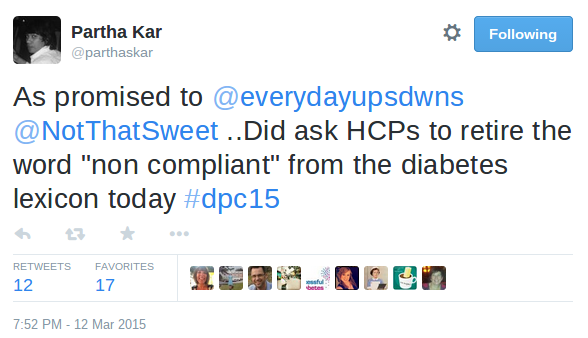 But "non-compliant" isn't the only dirty word used in diabetes healthcare. Some will no doubt consider this discussion to be overly PC, but language is important. It can and does have an impact on the emotional well-being of people and so conveying the wrong meaning can leave lasting damage to a relationship and result in less than ideal outcomes. We have all heard the rhyme "Sticks and stones will break my bones but, words will never hurt me". Unfortunately judgemental words repeated over and over again do hurt no matter how much you try to ignore them and in turn they alter outcomes for the worse. So maybe it's time to be vocal about all of the language that isn't helpful. What other dirty words exist? I'm offering these as a starting point for discussion and I'd encourage you to share the words you believe are dirty or if you disagree with the ones listed here, please share your thoughts. If we don't have the conversation on how words are interpreted, how will people find out the true impact of the words they speak? For the avoidance of doubt, the team I work with currently are most definitely in the enlightened camp and are very considerate when it comes to language (I wouldn't want to change them for the world and I'm not just saying that, I travel over 100 miles from my home because I believe they're worth it!) but unfortunately it hasn't always been the case. good/bad/poor management Usage: Do you have good control? Your control isn't as good as it could be. When it comes to bg management there are lots of things outside of my control: illness, stress, hormones etc, but I can manage my bg levels. If you think about it, if I don't have good control then I must have bad control - it's judgemental and leads to guilt and frustration. Please don't dehumanise me! Don't name people by the condition they live with, they have a name and they are human. Hang on, I'm normal too! Well as normal as anyone else is. If you call people without diabetes "normal" that makes me "abnormal", is that really what you are trying to say? A person living without diabetes is a better way to say it. Usually the newspapers are the biggest offenders of this usage but unfortunately I see more and more healthcare organisations using the term too. One NHS diabetes service recently tweeted: "IS THERE A CURE TO STOP PEOPLE SUFFERING FROM DIABETES?!" Sufferer implies a very negative situation, do I really suffer with my diabetes? Suffering sounds like I can do nothing about it. Yes, at times it can be tough but, I live with diabetes I'm not a "diabetic sufferer"! The All Party Parliamentary Group for Diabetes held a meeting today (4th March) to launch a report on diabetes education and peer support, something they have been looking at over the past year. If you want to learn more about this work you can read my blog: A year on diabetes education. The great and the good were in attendance and it was a privilege to be allowed to speak before ministers responded to the report's launch. Four years ago, on the 9th March I stumbled into a doctors surgery to be told I needed to go to hospital, it was serious, it was life threatening. I was told I had type 1 diabetes and would need to inject insulin for the rest of my life. I went home with a condition I knew little about, no knowledge of what I needed to do beyond taking the pills and I needed to eat healthy. I felt very alone! The following day I rang my GP surgery and because of an amazing practice nurse I started to feel supported. She spent time educating me and arranged a one day course on type 2 management. When I got my correct diagnosis of type 1 she arranged a half day carbohydrate counting course. When my diabetes care moved to Sheffield, I was offered a 5 day DAFNE course. It was a significant improvement on the education I’d received at Doncaster. DAFNE is a life changing course. Without it, I wouldn’t have known what to do when I was ill - I’d have been hospitalised at least three times due to illness without this knowledge. Without it, I wouldn’t know how to alter my insulin doses to enjoy hiking activities. Without it, I wouldn’t know how to safely manage my condition when having a drink at the local pub. Without it, I would never have spoken to some else with diabetes. Without it, I suspect my risk of life impacting complications would be much higher. But despite the value DAFNE has brought to my self care management there are gaps and a significant one is how to deal with the emotional side. DAFNE provided me with the tools and knowledge to manage the treatment but it totally missed how to manage the emotional. In light of this I founded (with another person with type 1) an online support community called Our Diabetes. We come together every Tuesday on Twitter, a social media platform, to discuss diabetes and each chat is hosted by a member of the community. The vast majority of chats run by people with diabetes relate to emotional well-being, titles such as. "I had heard so much about DAFNE from getting involved with the diabetic on line community [...] and was really in a ‘muddling along phase’ with my type 1 diabetes and getting nowhere fast. It was much easier than I thought to put my name down (via my hcp [...]) and I was exceptionally lucky to be able to attend the [...] course"
Our Diabetes isn’t just for those living with the condition but for everyone with an interest in it. We actively encourage healthcare professionals, charities, partners and even (dare I say it) politicians to be involved too! In fact one chat was hosted by the chair, Adrian Sanders, and was used to obtain evidence for the report launched today. I’m very grateful to the APPG for looking at this important subject and for reaching out to the community for their thoughts, some of which you can see on the monitor currently. But I’d like to end with a bit of history. On January 19th 1944 Rab Butler's Education Act cleared its second reading in the House of Commons. It paved the way for free secondary education for all. People wanted to believe that after the war Britain would be a better place - a New Jerusalem was the phrase of the time - a country worth fighting for. It’s time that diabetes education should to be provided to all. It shouldn’t be for the “lucky” few. It changes lives for the better. It will save the NHS money. It’s definately worth fighting for. You can read the APPG for Diabetes report: Taking Control: Supporting people to self-manage their diabetes here. The JDRF UK news article about the report and the Diabetes UK news article. I am not a health care professional. I am an individual diagnosed with diabetes and Raynauds. Anything written here is purely information on what has happened to me or observations about what I see. Posts should not be taken as medical advice and any changes to your own care should always be discussed with your own health care team.